This guide is designed to teach you more about the evaluation process and how to use the CRAAP Test, an information evaluation process that will help you properly evaluate the information you find. Once you find information, you will need to do some critical thinking to decide what to use for your research. Using the CRAAP Test can help you assess which resources will prove most useful for your process. If you would like a copy of the CRAAP Test, click the link below for a PDF of the text of this research guide. These sources are typically written by scholars or professionals who are considered experts in their fields. The purpose of these resources are to inform and report original research or experimentation through publication of their material. These sources are written and published to entertain, persuade, and sell the information that is presented. Popular sources will typically not include a bibliography and are usually written in plain language. Attractive format, usually with a lot of color or images. Distinct voice that is written in a simple format to meet the education level of a general reader. Can be written by any author, but usually composed by free-lance writers or specialized magazine/popular resource authors. 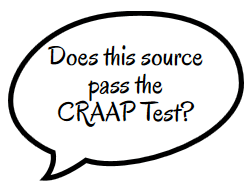 The CRAAP Test was created by Sarah Blakeslee, of the University of California at Chico's Meriam Library. Her original text serves as the basis for this research guide and handout and is used with the kind permission of the Meriam Library. Currency Currency can be more important in some fields, like science and medicine, than in some other fields, like those in the humanities, but having current information is usually recommended. Considering currency is important, though, so you are not using information that has been supplanted with new, better ideas and research. Does the source use recent information? Are the references and/or links current? Does currency matter for this topic? Why or why not? Relevance All of the sources you use in a project should be relevant to your topic. While you may not find the perfect source that exactly captures all of your ideas, the sources you use should be related in some way. If you are researching the SpaceX program, an article about founder Elon Musk's recent divorce is not relevant to your project. What aspect of your research question(s) does this source answer? Is the intended audience appropriate for academic research? Does this source provide a new perspective or piece of information? Is this source too technical or too general? Authority Authority lets us know that someone with expertise or experience in the topic is sharing their knowledge. Remember, though, that authority is contextual. Having a Ph.D. in Astronomy would not give someone authority to write about the impact of music therapy on children who have autism. The expertise or experience needs to be relevant to the topic. What credentials related to the topic at hand does the author have? Does the author have any relevant affiliations with a respected university or organization? What can you find about the author online? Has the author published on this subject before? Accuracy Determining the accuracy of a source ensures that you are using information that is supported and free from errors. Does the source contain any false information or errors? Does the source use reputable sources to support the claims made? Has the source gone through peer review? Are any research methods used well-designed and are conclusions from the research supported by the evidence? Does this source align with other sources that discuss this topic? Does the information seem complete, or are facts missing? Purpose Sources may be written to entertain, inform, persuade, or some other purpose. Understanding the purpose helps us to see if there are any biases or underlying motives that may affect the way the information is presented. Is this information clearly biased in one way or another? Why did the author or creator decide to share this information? Does this source present multiple points of view on the topic? Is the language used meant to evoke a strong, emotional response?